The large drawing in the centre is a close-up of a two shilling coin that I did when I was in the Fine Art rotation on my Foundation course. The black and white photos (apart from the one of me, of course), are ones that I have taken and developed myself. The Emilie Autumn poster is one that I was given for free at my first gig after I'd spent over £100 on merch. Nothing much to say about this bit. 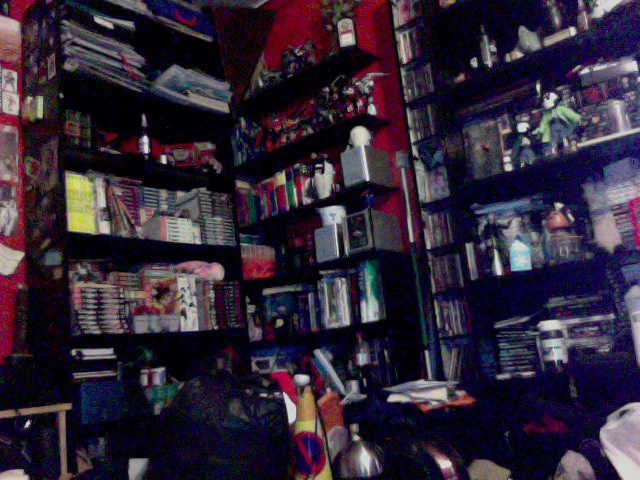 Books, CDs, Manga, DVDs, video games, random crap. And a traffic cone. And random things stuck in between. The little table by the side of my desk. 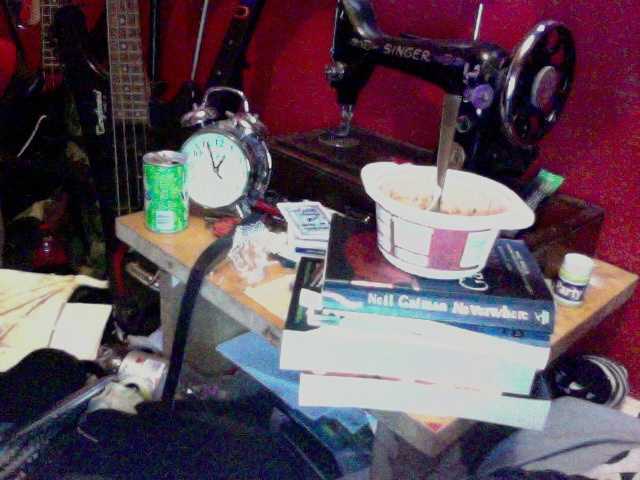 A slightly broken Singer sewing machine from 1938, a pile of books (Neverwhere, Coraline, WIcked and Whisper My Name), some lunch (with fork), an alarm clock that needs winding up, a pack of cards and other such things that are being untidy. 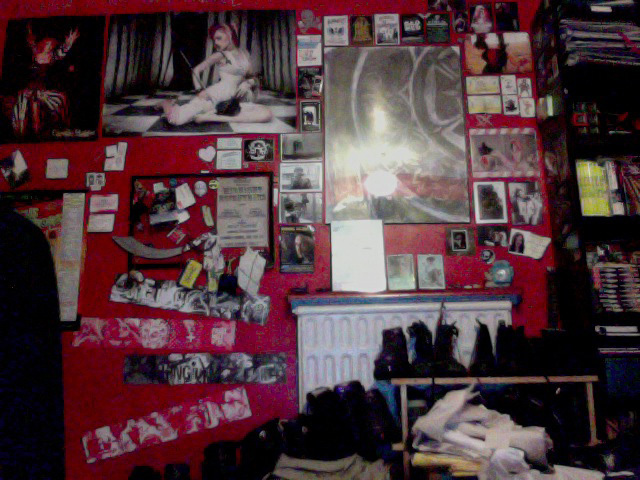 In the background, those are my bass guitars, Jack (the black one) and Agent Moulder (the red one). My desk is quite messy at the moment as I've been working. 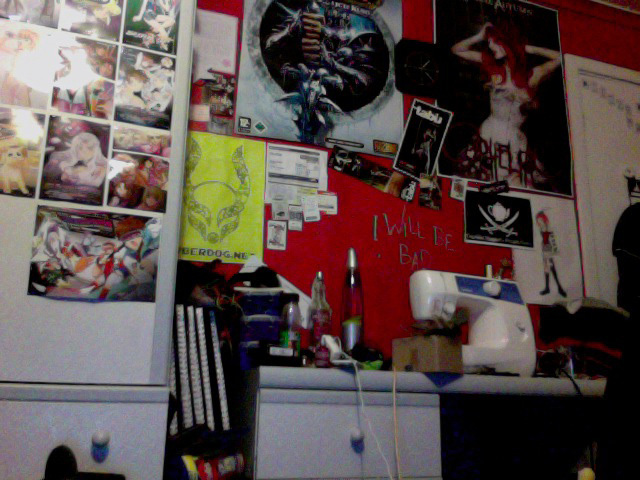 That sewing machine is Little Brother, dubbed 'my one true love' (is that still valid...?). Yes, that is a World of Warcraft poster on the wall. I got given it for free and want to replace it as soon as I've not played for a long time and I don't even have Lich King. In the middle is the program and various fliers from when I saw NoFitState Circus last year. Just to the left of that are various things from my Swedenventure, including boarding passes, the thing we had for airport internet and the pirate Jack of Spades. I guess that's it, really. My bed is in the middle - Well, I say 'bed', I mean 'two mattresses on top of each other'. There's a big-ish television too, with freeview, an Xbox 360, Gamecube, PS2, PS1 and a DVD player. The rest of it is just mess. And there you go. 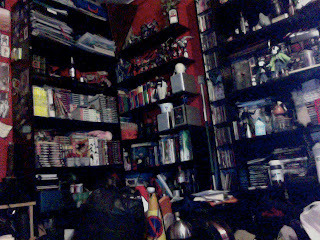 That's my room. Not that you were interested to begin with. My imagination has taken charge. I've ripped apart an old jacket to make a pattern. My sewing machine is waiting for some red cotton thread. I just need to buy my fabric. I'll make a coat, a waistcoat, some matching accessories, whatever. But, yes. I want to be a circus freak. In my possession, I now have two practice staffs, a fire staff, an LED staff, a hula hoop, some flowersticks, some poi, a diabolo, an acrylic contact ball, a few juggling balls and some stilts (though, my stilts are currently semi-MIA). I have practiced with static trapeze, acrobalance, plate spinning and various other things. I don't think I'm particularly good with any of these things, in fact, I'm pretty bad with a few, such as poi and plate spinning. I'm getting better with flowersticks and I'm trying to learn how to juggle, so I'm getting there, I suppose. I remember being at sixth form, sitting in the corner of the entrance hall where my little group of friends would hang out, sewing a tiny jester hat for a jester-stick I was making for a costume I would be wearing for my friend's birthday. I named him McCrikkit. I still have him. He's smiling at me from across my room as I type. That was the first time I actively tried to be a Jester. I loved the thought of being able to entertain the ignorant masses with my amazing jestery skills. Unfortunately, I was lacking in the aforementioned skills. All I could do was swing that broom handle around my bedroom. Now, I am lucky enough to be enrolled in a circus skills course that is held in the next town over. Imagine my glee when my friend told me about it. Yes, he originally said that someone hadn't wanted me to go, so I hadn't gone right away. When I eventually did start going, it turned out that the person who apparently hadn't wanted me to be there had said nothing of the sort. This 'friend' of mine who had told me about the course hadn't ever wanted to do that kind of thing before I had mentioned it to me. He had tried to steal my dream. On Monday evening, I climbed up onto the trapeze, intending to practice the few moves I know since I hadn't been up there since the end of November. However, I just sat, swung my legs and thought about my half-formed plans for the future, my plans of circus-gypsying across Europe with my love. As I sat, I saw myself juggling on a street corner in a far-off city, a bag of flowersticks, poi, balls and various other things by my side, then turning my head and smiling to my companion. She smiles back, and I know that I am the happiest that I have ever been. I throw the balls into the air and catch them all in the pockets of my self-made coat. A few onlookers clap and throw coins. My companion reaches her hand towards me. I take it in my own and she pulls me into an embrace. I am free. I got jolted back to reality after there was a cheer from the other side of the hall. The boys had managed to pull off a new acrobalance pose. With a grin, I dropped back down below the bar and swung around into Bird's Nest before dropping back down onto the mat. Yesterday, I found myself in a new circus shop that has opened in my town. I'd popped in to have a look after I'd bought some of the fabric I needed for my costume project at college while waiting for the next train into Hartlepool. After leaving the shop with a red and black diabolo, it occurred to me that there was little reason for me to go into college after all, since my model would not be there for me to do a fitting. I wandered into HMV, hunting out some CDs and a Skins boxset, but was drawn back into the circus shop. I spent at least an hour and a half in there as the owner taught me how to juggle. One step closer to my little daydream. When I finally left the shop, I had given the owner my contact details in case he needed any help in the future when the shop got up and running properly. Imagine that. Me, a wannabe circus freak working in a circus shop. Just a wannabe. I'm not a circus freak yet, but I'm on my way. Have you ever taken clothes from a dumpster in Sweden? My Nye friends - I moosh you all! And also Hrian. Nearing the end of my stay in Gothenburg, we came across a bag of abandoned clothes. If I'd seen this back at home, I'd have ignored it. However I came away with a blazer-jacket, two shirts and a pair of trousers. A whole outfit for free. I ended up wearing those clothes for my last couple of days. The trousers were very welcome - My jeans were a tad ruined from sliding around on the ice, I had fallen out with my 'punk' trousers after they took skin off of my wrist during a Saya attack, and my black and white striped trousers were getting stuff all over them (but only on the white, of course). The blazer ended up being another layer because it wouldn't quite fit in my case, and I ended up wearing a shirt because I doubted that I would get all my clothes back in, since trousers take up a fair bit of space. That's something I'm not going to forget - wandering around Gothenburg in 'stolen' clothes. Making proper Swedish Meatballs, and the inevitable, innuendo-filled comments that accompanied it. "In my defence, I don't really have much experience with balls..."
[thinking] "I wonder how they'd react if I just pulled out a random card..."
Splits deck, pulls out a card, slams it down on the table. Card is the Jack of Spades. You know, 'my' card. I could probably write that 'proper' prose post that I've been longing for if I focused only on you. You've taken up residence in my mind, and I do hope that you will choose to stay. I sometimes wish that I could write a nice, long, 'proper' chunk of prose for a blog entry. I have tried in the past, but it just came out as a complete pile of 'woe is me'. It's all very ugly. I envy those who can write. I really do. It's something I've always wanted to be able to do. I used to love writing stories as a child, but now I just end up mad at myself because I can't even begin. I'm always thinking 'I wish I could [whatever]...'. I can wish all I want, but unless I actually try to do something, I'm not going to get anywhere. My biggest wish (and if you know me at all, this will not be a surprise to you) is to be a circus freak. I'm half way there, already being a freak as I am, but I'm tripping up a bit with the 'circus' part. But what use is that if I never practice? But no, no I'm not. Or perhaps it's just me thinking that I'm horrible at all of these things. A further example is with drawing. I look at my sketches and think 'How awful. I can't draw at all. 5 years studying art and that's the best I can do? ', but people tell me that they're good. Despite this, 'I wish I could draw' is up there on my list. I also wish I could sing, but I think that one is pretty much out of my hands. My voice lacks the natural talent needed for that kind of thing. But, I digress, probably, as I did promise my immense collection of readers that I would regale them (or regale you, I imagine) with tales from Gothenburg. However, since I'm pretty sure that anyone who actually reads this actually was in Gothenburg at the same time as me, it seems pretty pointless. If my assumption is incorrect, please, do inform me and I'll make more of an effort in the future. Yet again, my chunk-of-prose seems to have failed. Until next time, faithful reader! The thing that is most vivid in my memory is the view from outside the window as my plane left Stansted. The lights of civilisation below me, contrasted against the blankness brought by the night, like clusters of man-made stars. You can say anything you like regarding the beauty of nature, but, to me, those lights were more beautiful than any mountain, any forest, any natural landscape you could find. Of course, I was never supposed to be flying anywhere from Stansted Airport, but the weather likes to play tricks on us humans. I suppose my flight back from Gothenburg had to be cancelled. There's no way the universe would have let me have had such a, dare I say it, perfect time. Have you ever wanted to expect something, yet been so very scared that everything would go horribly wrong? Have you ever then had that 'something' turn out to be better than you ever dared to expect? My brain is, as usual, failing me. It doesn't want me to talk about how I hated the feeling of being 'squashed' on my flight from Edinburgh, or how I managed to become almost immune to it on the two flights that took me home. Nor does it want me to talk about how I made real Swedish meatballs or how a new card game was invented, or how I managed to spent a total of well over 24 hours in the corner of the most comfortable sofa in the world. All it really wants me to mention is one person. And how much I miss them. Give me a night's sleep and I'll try once again to amaze you with tales of snow, Crobin and Hallonsoda.